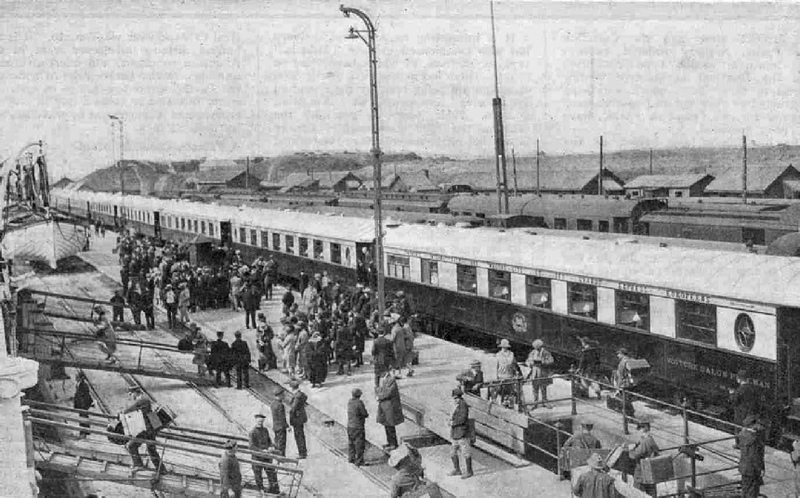 Boarding the “Golden Arrow” at Calais. IT is a sure sign of growing public interest in railways that not only is the habit of naming express locomotives once again on the increase, but there is an outbreak of giving names to the “crack” express trains as well. And why not? It is much more exciting to look forward to a trip on the “Flying Scotsman” than a mere journey on the “10 a.m. From King’s Cross”, and there is no doubt that the choice of a suitable nickname for a present-day flier, in these days of speed, is a powerful advertisement in its favour. The train that is the subject of this article is barely a year old, but it is already world-famous. It would hardly have been possible for its owners to have hit upon a title more thrilling and as the same time more appropriate, than the “Golden Arrow”. So far as concerns its “arrow” character, it is the fastest train in the world, for the distance covered - even on our own Great Western Railway no regular train is booked at 58.1 miles per hour average speed over a journey as long as 184 miles - and the “gold” is well exemplified in the magnificent Pullman cars that exclusively make up its passenger equipment. If, regretfully, we have to concede to our French friends the palm in the matter of speed, and, as we shall see presently, in the locomotive work entailed by the haulage of a train of this tremendous weight over the grades between Calais and Paris at such a rate, we can at least comfort ourselves with the reflection that, when our neighbours want to purchase the most comfortable coaches that money can buy they have to come to England for them. For you will find on each one of the magnificent Pullmans that make up the “Golden Arrow”, as you will on the sleeping and dining cars of the equally famous “Blue Train”, the name-plate of a British manufacturer. Long before we have actually moored at the Quay at Calais we shall have “spotted” the long train of cars, in the familiar Pullman livery of umber and cream, standing on the quayside awaiting its passengers. Lest we should make any mistake, we shall, find painted on the side of each coach two real golden arrows. In addition to this, each car carries its title in English and French - “Pullman Car” and “Voiture Salon Pullman” respectively - as well as the imposing name of the owning company, which takes up the whole of the above the windows - Compagnie Internationale des Wagons-Lits et des Grands Express Europeans”. We call it the “International Sleeping Car Company” for short. Right Away! 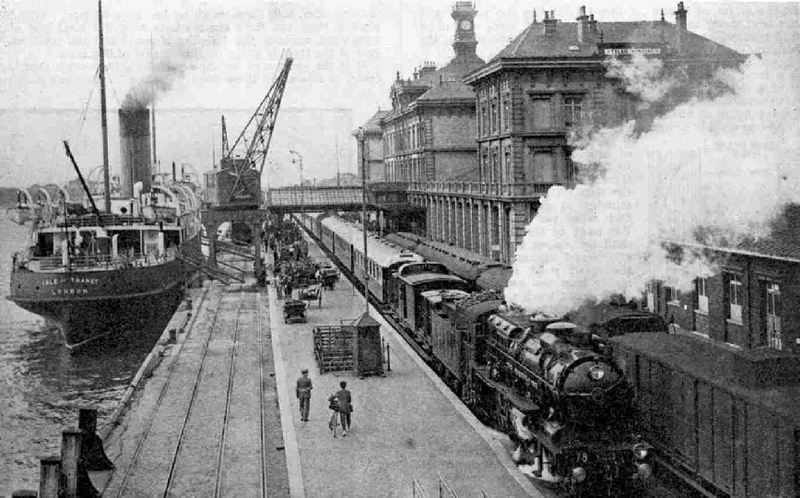 The “Golden Arrow” leaving the Gare Maritime, Calais. Ten Pullmans make up the total passenger accommodation of the ‘‘Golden Arrow”. As you will see in the photographs reproduced, they are longer than our English cars, and the interior view will show you that they are wider, too. Each coach is 77 ft in length over buffers and 9 ft 7-in in extreme width. The Pullmans are assembled in pairs, each pair seating 60 passengers, and having its own kitchen, so that passengers can be served with meals exactly where they sit, instead of having to walk through the train to a dining car, Altogether, therefore, 300 first-class passengers can be carried, in the most luxurious fashion possible, the extra charge demanded, over first-class fare, being the very reasonable one of about 13s. 6d. The only other vehicle in the train is the peculiar-looking luggage-brake, seen in the photographs next to the engine. The middle part of this is a van of an ordinary type, but it is flanked on either side by detachable luggage boxes, or containers. These have been loaded at Victoria Station in London with the passengers’ luggage, lifted by powerful cranes off the Southern Railway luggage truck at Dover on to the steamer, and then, transferred by crane at Calais on to the two ends of this combined van and luggage truck, for the journey to Paris. You can well imagine how much time and trouble are thus saved at Dover and Calais, seeing that the staff have not to handle each article of luggage separately. Another privilege that is accorded to “Golden Arrow” passengers, in exchange for their extra fare, is that they do not have to pass through the “customs” but have their hand luggage examined on the train after leaving Calais. This enables the “Golden Arrow” to get away very quickly after the arrival of the boat. In fact, with this quicker start, passengers having left Victoria at 10.45 a.m. (or at 11 a.m., if they travelled by the second part of the boat train) can now reach Paris at 5.40 p.m., instead of at 8.15 p.m., which is the time of arrival of the remainder of the passengers. if the train is full, we have a total of 525 tons. The engine has got to run this enormous weight over the 184.1 miles between Calais and the Gare du Nord at Paris in 190 minutes, at an average speed of 58.1 miles per hour throughout. For most of the distance, as we shall see, owing to certain heavy grades and intermediate slowings, the speed must be considerably higher than this average figure. If we can teach the French how to build railway coaches, let it be said at once that they need to learn little from us in the matter of locomotive construction. We shall find one of the latest “Super-Pacifics” of the Chemin de Fer du Nord at the head of the train, numbered somewhere between 3.1201 and 3.1240. Although they are not as heavy as the 4-6 2 engines of certain other French lines, it is tolerably certain that no other French railway can equal the Nord in the performance of its locomotives, indeed, in proportion to their size and weight, it is questionable whether any other railway in the world could beat what these Nord “Pacifics” do day after day, not only on the “Golden Arrow” express, but on many other trains as well. Between Abbeville and Paris, for example, the “Golden Arrow” is only allowed 108 minutes for the distance of 109 miles, start to stop, and the outward bound 10 a.m. and 12 noon boat trains from Paris to Calais get 110 minutes in which to make the same journey, start to stop. The afternoon boat express, leaving Paris at 4 p.m., for Boulogne, is expected to run the 140½ miles to Etaples in 141 minutes. All these timings include a very severe slack, to 15 miles an hour, through Amiens. In the north-bound direction from Paris the heavy 8.10 a.m. express, with portions for both Brussels and Berlin, is booked to pass St. Quentin, 95 miles from the start, in 93 minutes, reaching Aulnoye, 134 miles, in 138 minutes; while the 7.30 p.m. north-bound express does the same journey in a minute less. Yet again, the 119¾ miles from Paris to Arras are run by various trains in 121, 122 and 123 minutes. And what is the size and power of the locomotives to which the heaviest of these duties are entrusted? The “Super-Pacifics” referred to in the last paragraph but two, weigh without tenders 95 English tons in working order, or 21 tons only more than the “Flying Scotsman” 4-6-2 engines of the LNER. Enormous eight-wheeled tenders have to be carried, as there are no track-troughs between Calais and Paris, and in running trim, full, these weigh no less than 84 tons. With their tenders, therefore, these engines have to pull a total load of 590 tons when working the “Golden Arrow”, and the total moving load of the train is in the neighbourhood of 685 tons. locomotive working has never taken a hold in this country, with, the exception of the familiar Midland compound 4-4-0 engines of the LMS Railway, it is the customary method of locomotive propulsion on the Continent of Europe. It may be explained, for the benefit of any reader who is not quite sure what the word “compound” means, that the steam is carried direct from the boiler to one or two “high pressure” cylinders, in which it goes through a part of its expansive working; after that it is led on into two “low pressure” cylinders, where the expansion is completed. The Nord engines are compounded on the “de Glehn” system, the two high pressure cylinders of which are seen, outside the frames, while the low pressure cylinders are inside. It needs brains to get the best work out of a compound. The training of express drivers is carried, rather further in France than it is in this country, which furnishes in part, no doubt, the explanation of the extraordinary feats that the Frenchmen get out of their engines. The design of the engines themselves provides the rest of the explanation. Each pair of cylinders has its own set of Walschaert’s valve-gear, and the driver can vary the cut-off in both high and low-pressure cylinders independently of each other, the knack in managing these compounds lies chiefly in working these two cut-offs in exactly the right proportion to each other - the high pressure, of course, later in the stroke than the low pressure - to make the best use of the steam generated in the short boiler. The “Golden Arrow” at full speed, near Villiers-le-Bel, en route to Calais. The fireman, too, has a strenuous task. In the first place the coal burned is of poor quality as compared with that to which our engines are accustomed, and is often in the form of “briquettes” or slack coal compressed into blocks. Then the firebox is exceptionally long and narrow - 11 ft 6-in in length by 3 ft 3-in in width - so that the fireman has to shoot the contents of his shovel over quite a long distance. Yet the consumption of fuel on these enormously hard duties, and poor fuel at that, varies between 60 and 70 lb a mile, or not above 10 lb a mile more than, the average of the LNER “Pacifics” which use superior coal and, on the average, perform considerably easier duties. Economy in coal consumption in the French engines is assisted by the entirely automatic heater of the boiler feed-water, seen in the picture above on the top of the boiler behind the chimney. This, it is calculated, is responsible for saving 7 lb of coal per mile. But the hour of departure has now arrived and we must board the train. The timetable gives the start as “14.30”, according to the twenty-four hour system prevailing abroad; in our English time it is 2.30 in the afternoon. It is a very difficult exit from Calais. From the Gare Maritime through the Town Station, for a distance of well over two miles, there are many sharp curves. Then, after a brief level run, the engine is faced, four miles after starting, with the beginning of the tremendous climb up the down-land behind Cap Gris Nez, to the summit at Caffiers. For seven miles this grade is continuously at 1 in 125, corresponding almost exactly with the worst seven miles of the climb from Carlisle up to Shap, on the West Coast main line of our LMS Railway. By one of the rapid accelerations that are so common on the Nord, from the outskirts of Calais to the foot of the ascent to Caffiers we may expect to have attained anything from 50 to 55 miles an hour. Up the 1 in 125 speed will steadily fall, of course, but we shall probably top the summit at not far off 40 miles an hour. The upper stages of the climb may make it necessary for the engine to he worked in somewhere near full forward gear, in both high.and low pressure cylinders, with the regulator wide open as well. If we were on the footplate we should see that the boiler was finding all the steam necessary for this tremendously hard work, the needle of the pressure gauge remaining steadily at the 227 lb mark. In all probability the power exerted by the locomotive on this climb closely approach the figure of 2,220 horse-power at which the “Super-Pacifics” are officially rated. Once over Caffiers Summit we have before us a 7-mile descent at the same inclination past Marquise, and then sharp undulations at the same figure to Boulogne. In running downhill, the driver will not exceed the maximum figure of 120 kilometres (75 miles) per hour that is laid down by statute in France. Part of the equipment of his engine is a speed indicator, which not only shows him the exact speed at which he is running, throughout the journey, but takes a record of that speed on a moving roll of paper. This is another matter in which our friends on the Continent are ahead of us. The roll is not accessible to the driver, but keeps an automatic record of his journey, which makes him very careful to see that all the prescribed restrictions of speed are duly observed. His speed indicator helps him in their proper observance. From what we have heard about the French railways, we may think even 75 miles an hour to be something more than safe. But do not let us disparage the track of the Nord. Since the war a great deal of money has been spent in putting it into first-class order, and although possibly it may not quite equal the very best in our own country, yet it is of a solid and well-laid character. In common with almost all Continental railways, the Nord uses a flat-bottomed rail, in place of our familiar dumb-bell, or bull-head section; the rails weigh 92½ lb per yard, and are 18 metres in length, which is just 6-in shorter than the LMS standard of 60 ft. Chairs are not used, of course, but flat steel “sole plates” distribute the weight of the rails to the sleepers, of which 30 are used to every rail length. Some of the movable “tongues” of the main line switches are no less than 40 ft in length. We dash through the Tintilleries Station at Boulogne, 26¼ miles from Calais, threading several tunnels as we skirt the eastern suburbs of the town, and then swing round to join the line from the Gare Maritime at the junction known as the “Bifurcation d’Outreau”. The speed round the curve will be rather higher, very likely, than that to which we are accustomed in England, but we need not fear that the driver is taking any undue risks, even though we do go over the junction at 50 miles an hour or so. After 4½ miles of level running from the Outreau Junction, there comes a sharp rise of four miles to Neufchatel, and a corresponding descent of five miles to a point near Etaples. But now the engine has an easier length ahead. For the next 56 miles, through Etaples and Abbeville and almost to Amiens, the line is practically dead level, and it is along here that our engine and her crew will show their progress. Mile after mile will be ticked off at an even speed of 68 to 72 miles an hour, and an average of round about 70 - really marvellous work with such a load as 525 tons behind the tender. The speed will be slightly interrupted by a slowing to about 50 an hour through Abbeville, 75 miles from the start, but after that we shall go on unchecked until we are nearing Amiens. The station here is so sharply curved that a reduction to 15 miles an hour is imperative, and we shall find it rigidly observed. We have now covered 103 miles of our journey. speed but little short of 60 m.p.h., and then down the corresponding descent to Creil speed will once again rule well up in the “seventies”, till we thread that station at a reduced speed of about 50 an hour. We have now 31¼ miles left of our journey, and a little over half-an-hour in which to cover them. From just beyond Creil, where we are joined on the left by the main line from Brussels and Berlin to Paris, our driver is faced with a 12-mile ascent at 1 in 200 - exactly the same inclination as the rise from Wood Green to Potter’s Bar, on the LNER main line, but half as long again. Even up this bank we shall travel probably, at a round 55 miles an hour, and then a swift final dash down a bank of precisely the same length and steepness will bring us from Survilliers Summit down to St, Denis - a very important railway centre, well inside the Paris suburbs. Five minutes later we are drawing up in the Gare du Nord. The only task now remaining is to muster up our best French, and go and congratulate the driver and fireman. To have worked a load some six times the weight of the engine over the grades that we have just recounted, with foreign coal, at an average speed of 58 miles an hour throughout, with due observance of the various slacks and no higher maximum speed than 75 miles an hour, is a feat indeed. And yet it is being done every day by the “Golden Arrow”. You can read more on “The Dover Pullman Boat Express”, “The Golden Arrow” and “The Northern Railway of France” on this website.